Greetings, and happy Friday! It’s been a whirlwind of a week! I feel like this time of year, right after back-to-school, when it’s darker out in the morning and pumpkin-spice themed things start popping up EVERY.WHERE., things just get so crazy! Between work, small groups starting again, and arranging travel plans for the holiday season, could there just be like, two more hours in the day? Which is why it’s so important to have recipes like THIS one up your sleeve! 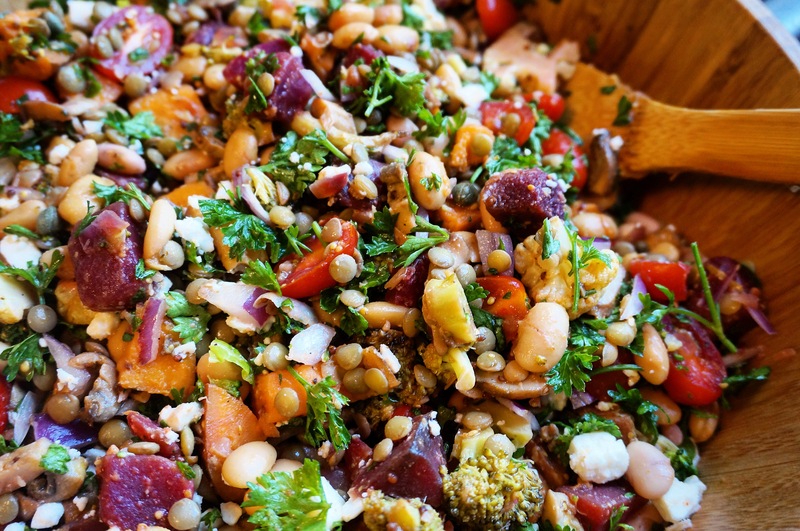 I’ve made a twist on this before (try my Chickpea Lentil Power Salad) but this time I used different beans, herbs and veggies. It always makes way more than I intended to… which is good in a way, because that means Ben and I can eat some today, bring some for lunch tomorrow, and use to supplement our meals all week (and then freeze some, give some away, and look- there’s still a ton left- why not just feed the dog, too?). But seriously. The trouble is real. I love the combination of the curry powder (Fun fact: when I was writing this post I forgot to add curry powder into the ingredients list! It would’ve been pretty disappointing for everyone who read the title of this post to make this and not taste ANY curry!) with lemon and parsley. Plus, this recipe is loaded with staying power from lentils and white beans. I added roasted broccoli, cauliflower, beets, sweet potatoes, and mushrooms as well, with some fresh grape tomatoes. Brussels sprouts were also involved, but kept separately for my brussels sprouts hater of a husband. But I still love him. Which is why they are kept safely in a separate container and tucked away in the fridge for me to hide in his salad enjoy in mine whenever I want. 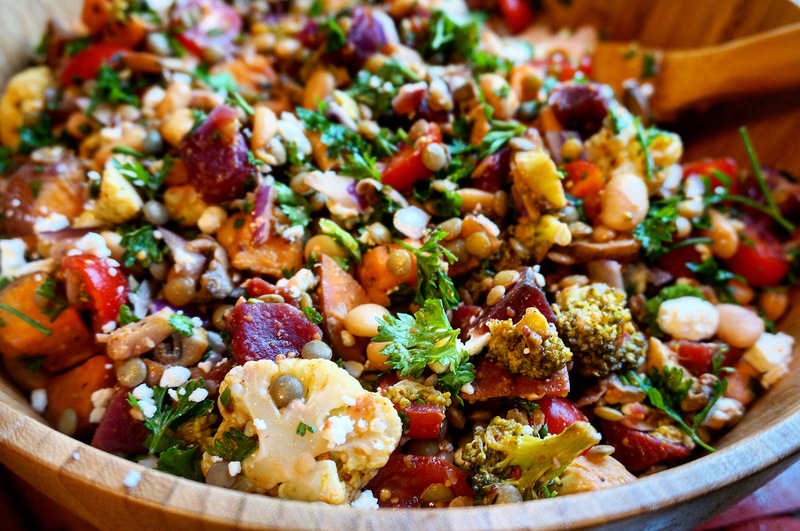 Enjoy this power-packed salad as a main dish or a side. It goes great with spinach, feta, and pita bread! Also, a token dollop of Greek yogurt. Prepare lentils according to package instructions, until al dente. Steam potatoes in a steamer basket over lentils while they’re cooking. Whisk together ingredients for vinaigrette (lemon zest through olive oil). Combine the white beans, beets, broccoli/cauliflower, and mushrooms. Add the sweet potatoes (they should be almost cooked through). When oven is preheated, pour half of the vinaigrette over the vegetables and spread on a Silpat- lined baking sheet. Cook 20-25 minutes or until tender. Meanwhile, in a large bowl, mix together lentils, red onion, tomatoes, and parsley. When veggies are done, allow to cool about 5 minutes and then combine with the lentil mixture. Drizzle remaining vinaigrette over the top and toss. Top with feta and serve over spinach, with a spoonful of Greek yogurt!